Fort Willem I at Ambarawa, Central Java was actually an enormous village including houses, military barracks and working places for 4,500 people. In 1844 the first group of military personnel was housed in the fortress, but it lasted till 1850 before the fortress was fully occupied. Earthquakes in 1865 and 1872 caused major damages and the upper floors were no longer suited for habitation. By the end of the 19th century the fortress was no longer used as a military settlement. 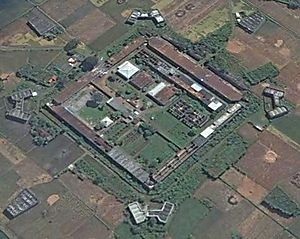 The Garrison hospital 2nd class Willem I was a general military hospital that was established at Ambarawa (Semarang). It was a public hospital, part of the Military Medical Service. Its reputation was very bad, which was abundantly illustrated by the Officer of health 1st class, Bleeker, when he mentioned the large problems its patients experienced, leading to high morbidity and mortality in 1848. His report mentions capital disfunctionality of the hospital and he calls this odd in view of the luxurous buildings and inventory of the other settlements of the vestige Willem I. The hospital had at that time two floors with only two wards at the ground floor and three wards in the first floor. The rooms were dark and far too small. There were no facilities for pharmacy, store-rooms or outpatients. All these comments were made by the officer of health Bleeker. In 1869, E.W.A. Ludeking (1830-1877) was appointed “dirigerend officier van gezondheid” of the Groot Militair Hospitaal Willem I. Apparently, the hospital had in the meantime been promoted from garrison hospital to one of the three Grand Military Hospitals on Java (the two others being Soerabaja and Batavia). From:Schoute, “De Geneeskunde in Nederlandsch Indie” (GTNI 75 (1935) 825-828, a survey of all military hospitals is produced in 1867. The hospital Willem I had on average 82 inpatients in that year. At the end of the year 1890 the number of inpatients was 189. (See Excel file Military hospitals 1890). The annual report of the Civil Medical Service of 1909 mentions that the military hospital of Ambarawa admitted in that year 33 European and 521 Indigenous indigent patients. 1 European and 29 Indigenous patients died. Ambarawa was a District of the Residency Semarang in the province of Central Java.